The primary article I rely heavily on for these types of questions is Deploy Dynamics 365 App for Outlook. I’m going to take a few minutes to breakdown some of the information in hopes that it helps you better navigate and understand the article. Before diving in, there are a few pieces of information that will come in handy for you to have. Is your organization on Dynamics 365 Online or OnPremise. If not Dynamics 365, what version of OnPremise. Is your organization on Office 365 with Exchange Online, Office 365 with Exchange OnPremise, Exchange OnPremise only and no Office 365 or something different. If Exchange OnPremise, which version and service pack. Which version of Outlook does your organization use. With the above information in hand, you will be better prepared to identify the Dynamics 365 App for Outlook capabilities that are available to you. The reason why it is important to understand what version of Exchange you are running is because the App for Outlook requires Server Side Synchronization. You must setup Server Side Synchronization to use the App for Outlook at this time. If you have Exchange OnPremise, the minimum version supported in any scenario, Dynamics 365 Online, Dynamics 365 OnPremise, and CRM 2016, is Exchange 2013 with Cumulative Update 14. If your users plan to use “Outlook on the Web”, pay attention to the supported browsers and the required configuration for those browsers. There is a significant amount of information in the article to include several “Important” snippets that come in the below or a similar format. It’s important to pay attention to these informational items, distributed throughout the article, especially if they possibly apply to your scenario. Take the time to read and understand them. 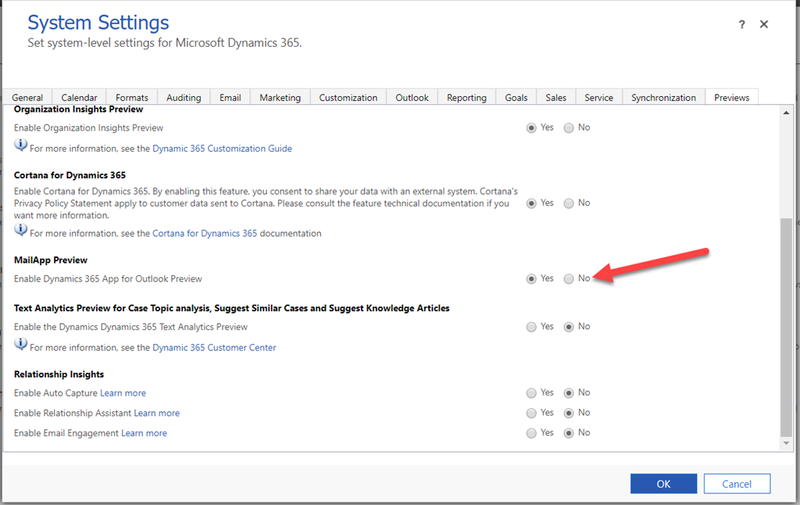 If you want to understand the differences between the App for Outlook and the Outlook Client then the “Comparing Dynamics 365 App for Outlook with Dynamics 365 for Outlook” table is where you will want to focus your attention. As you will notice, the App for Outlook, includes almost as many features as the the Outlook Client with the exception of sorting and filtering views because displaying a list of records (a View in Dynamics) is not available from the App for Outlook with the exception of a list of Contacts (at this time). One important note, the comparison table is current for the December 2016 update for Dynamics 365 (online and on-premises). It is not current for the latest release. Some additional features have been added since this table was updated. For example, we can track and set regarding to tasks that we create through the App for Outlook. Additionally, the Outlook Client has been deprecated so it is in your best interest to make the move to the App for Outlook sooner rather than later. I’ve found the information regarding the “Supported Mobile Devices” and the “Supported Clients per Feature” invaluable. My hats off to anyone who can memorize the “Supported Clients per Feature” matrix. I reference it just about every time I receive a question where the information in the matrix applies. There is so much information packed into it that I think we could run a trivia hour on it. The first thing that will help you traverse the matrix is to understand the legend. The legend provides the combination of the Dynamics 365 application combined with Exchange that works in each one of the scenarios. You’ll also want to be familiar with the ‘additional information” noted in the numbers 1 – 8 below the legend. For example, although Outlook on the Web includes the “Compose Email” features, when using Dynamics 365 online with Exchange Server 2013 OnPremise, you must have the Exchange Cumulative Update 2014 installed for that feature to work. The key to using the matrix is to first find the Outlook client you plan to use from the far left column, next find the version of Dynamics 365 and Exchange combination that you have from the legend below the matrix, notice the color of the dot and skimming the row associated with your Outlook client, look for the colored dot and you will see the features that are available to you in each row. Here’s an example to help better understand the above. In this scenario, the organization plans to use the Dynamics 365 App for Outlook with the Outlook on the Web client. The organization has Dynamics 365 online and Exchange Online. Here you can see the view of each feature by looking for the blue dot within the row to the right of the Outlook on the Web client reference. You’ll notice that the Contacts feature is not available in this scenario. Keep in mind that the matrix displays information that is current as of the December 2016 update for Dynamics 365 (online and on-premises). 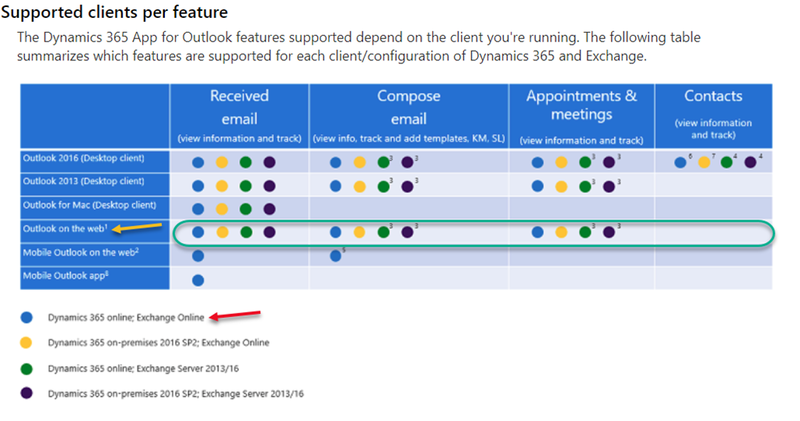 New features could have been added so if you find your infrastructure scenario in the matrix, I encourage you to try out the Dynamics 365 App for Outlook by following the deployment instructions on this TechNet article to see if additional features are available. Once you complete setup, if a user receives the following error message, “You haven’t been authorized to use this app. Check with your system administrator to update your settings.” then refer to the section titled “Required privileges”. It will provide you with a list of changes you need to make to the user’s security role. In closing, don’t forget, the Dynamics 365 App for Outlook for Microsoft Dynamics 365 Online Version 9.x is available for public preview. You can try it out by signing up for a new Dynamics 365 Trial and add Exchange online to your Office 365 tenant. Once that is setup, select the Preview tab under Settings, System Settings, select “Yes” next to the MailApp Preview option and select Ok. Now you are ready to setup Server Side Sync and Deploy the App. the most worrysome part of your post is the very last: While the app is the preferred (and soon the only) way to go and Outlook synchronisation is THE feature for Dynamics CRM, the app still is only in Preview and honestly, we currently experience issues with it on a daily basis. Does anyone out there has an idea when the app is going to move from preview to production? And: What can we do in the meantime to work with a Dynamics 9 tenant? * What are the best workarounds at this time? Any experience that you (or some other readers) might share? Still going with the (depreicated) Dynamics for Outlook? * Are issues with the app commonplace or might it be some kind of configuration issues on our side? And again, please do not get me wrong: I like the app and ist capabilities, including OWA, etc., so completely agreed to your post on that. 1. Many features of Dynamics are released first in Preview mode. Nothing new here. Been going on for a few years. 2. I don’t encourage workarounds as I don’t think they are needed.